With 2019 having begun, and the 35th anniversary left in 2018, we're only a few short years away from the MLP brand's 40th anniversary, which will be upon us before we know it. I wonder if you guys have any hopes or desires to see something specific being released- whether by Hasbro or a third party company, like Bridge Direct. Another thing I'd definitely love to see for this anniversary is the production and release of Bonnie Zacherle's two original prototype ponies for the pony line- in their natural, earthy colors. 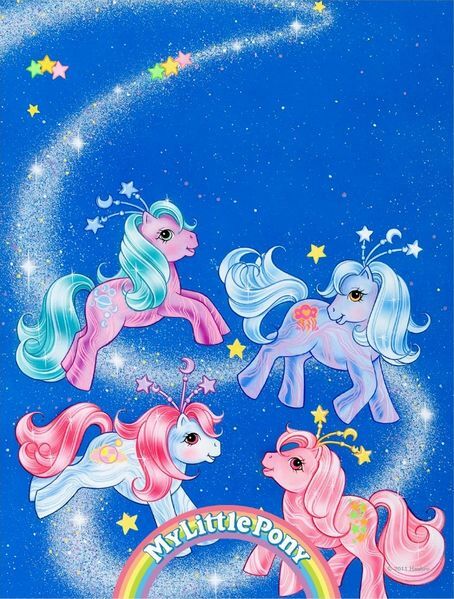 Additionally, I really hope that the "Celestial Ponies/ Fairy Lights" get produced. what do you guys hope to see? The Flutter Hideaway! *swoons* I would be in heaven! Honestly, I'll probably just be happy for Hasbro to acknowledge the anniversary. I must say that Basic Fun has done a great job with the ponies they're making, and I am excited for more. (Supposedly, there's a "three-year plan" for releases.) I would LOVE to see the Fancy Swirl Ponies brought to mass-production, as well as the Flutter Hideaway. a three year plan, you say? I hope Basic Fun doesn't disappoint. Big Brothers!!! I would love it if they would release UK ones in North America and vice versa... I would love to add the mountain ponies to my collection without signing away my soul. It would also be cool to re-release a few mail order ponies. Thanks a friggin LOT, Hasbro! Considering the fact that Hasbro (as well as other companies) hasn't celebrated a '0' anniversary since the 10 year one I don't think there will be much happening for the 40 year anniversary. Possibly the 50th one, but for some reason Hasbro as well as other companies seem completely focused on the '5 ones' (25th & 35th) The 25th I can understand but the 35th just seems like such an odd anniversary to focus on in my personal opinion Oh well. I can also understand peoples excitement with the re-releases of the old ponies that Basic Fun is currently producing. Personally, though, I don't care much for it. I'm personally not particularly interested in 3-4 Cotton Candys. I mean there's the CC one, the FF one, the 25th anniversary one and now the 35th anniversary one... You get my point At a certain point I just feel 'enough already' I want new things, not re-releases. 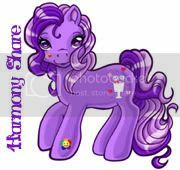 On my page Desert Rose's Dream you'll find my wishlists along with other pony goodness. Feel free to stop by for any reason. Twinkle Eyes, Sweetberry ponies, and the TaFs. I agree completely. While I do understand the thrill of walking to to toy section of a store and seeing the familiar blue packaging and our beautiful friends waiting inside... I don't want ponies that I already own. How amazing would it be for an anniversary release of the ponies they never produced? You know there is a list somewhere of names they laid claim to, not to mention color schemes, etc. Why not make totally new ponies in our favorite molds and release those for a celebration!? I'd like maybe a combination of G1 and G3. G1-style, but with extra coloring and symbol flourishes like G3. Maybe G3s done in G1 style, or vice versa. I think that could be fun. I also would like some G2 love, but I really doubt that'll ever happen considering they weren't as popular. I'd really like to see Baby ponies, twins, teeny tinies, teeny tiny twins. G4 characters done as G1s would be fun. Or will they have moved onto a G5 by then? I haven't really kept up with if/when that change is happening. Yes, I'd love the teeny tiny twins! They're so chubby and adorable and I need more.